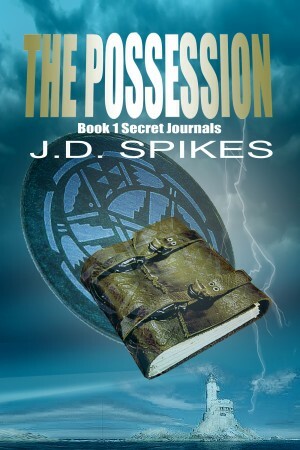 Today’s Sneak Peek is from the YA paranormal The Possession by Lachesis author J.D. Spikes. Daphne Wentworth is almost seventeen, definitely a red head, and most likely the tallest girl in her class, which is awkward to say the least when it comes to dating boys in her school. But she doesn’t have to worry about school for the next two months since she’s spending the summer at her aunt Dwill’s lighthouse in Maine. What she does have to worry about is seeing ghosts in the lighthouse cemetery, having strange dreams, and hearing the voices of star-crossed lovers who lived two-hundred years ago. And then there’s a local boy named Zach Philbrook who works for her aunt. He’s too gorgeous for his own good. He’s also very tall, with midnight black hair, and the most beautiful indigo blue eyes Daphne has ever seen. Zach is treated like an outcast by the local teens in town. He’s Micmac and therefore not “one of the gang”. Daphne can’t help being drawn to his strength, especially considering that he’s had to live his entire life dealing with ignorance. But the local teens aren’t the only trouble-makers in town. As Zach and Daphne get closer, the lighthouse ghost lovers begin haunting them. When Daphne and Zach try to figure out how to fight them, the spirits get bolder and more dangerous. The cemetery wasn’t far and wasn’t scary. Not to me. Just a scattering of old stones with ancient memories written on them. People long gone to another life and no one here who remembers them. I dropped my canvas shoulder bag of goods on the ground near the gate. Wrought iron and rusted, it leaned into the cemetery boundaries at a precarious angle. Thank God I didn’t have to push it open . . . I’d have probably landed on the ground with a rusted spiral in my gut. This place was unfamiliar to me, except in passing. Though I’d known of the cemetery’s existence, I’d never gone in. I had too much to do in the land of the living for my short time here. No one ever came out here, so what difference did the overgrowth make? Aunt begged to differ and insisted I clean the place up. The lighthouse was two hundred years old this summer, she reminded me, and the cemetery belonged to the lighthouse. So, on a bright June day, I found myself alone in a somewhat decrepit cemetery in a clearing in the woods. I made my way around the ancient stones in an attempt to put off the start of my project. Most were upright and clear enough of the tangle of brush that a portion of the inscription could be read. One small stone, nearly buried in the overgrown grass at the north corner, caught my eye. I flattened enough of the green to reveal the single word Sarah, and beneath it Age 3 Months. Sadness flashed through me, unexpectedly. There were babies buried here? I slipped the hand pruners from my back pocket where I’d stuck them and carefully snipped the grass down in front of the headstone. I pulled viney growth from the top corner of the stone, revealing a W. and a P. Sarah W.P. My hand cramped as I diligently snipped away at the grass, clearing the plot. The screech of the gate would have warned me . . . had the gate been in better repair. With its useless tilt, however, I never heard him coming. The bag dropping next to me on the mixed pile of living and dead debris announced his presence. I flipped to the side, tripping myself with my legs, but managed to keep the pruners in front of me. I pointed them into the air in front of my face. Blue-black eyes studied me, one hand hooked into his pants pocket by the thumb, the other paused in front of him, fingers splayed where it had dropped the bag. In books you always read about these moments. Crickets clicked, or birds called, or someone’s watch ticked, marking time. Maybe all three. In real life, the only thing you really hear until you recognize that person is your own heavy breathing, that being indicative of the fact that you are in the middle of nowhere with no possible help nearby. So how do you protect yourself from something that isn’t really there?